Last week I saw Peabody and Sherman. It tugged at my nostalgia strings and brought me back my time watching syndicated Rocky and Bullwinkle cartoons. However, during the previews I saw a trailer for something I didn’t know was coming, the Annie remake. I am notoriously oblivious and I didn’t make the connection despite the trailer showing a bunch of orphans cleaning and singing “Hard Knock Life.” I blame popular media using the song and separating it in my mind from the 80’s musical. 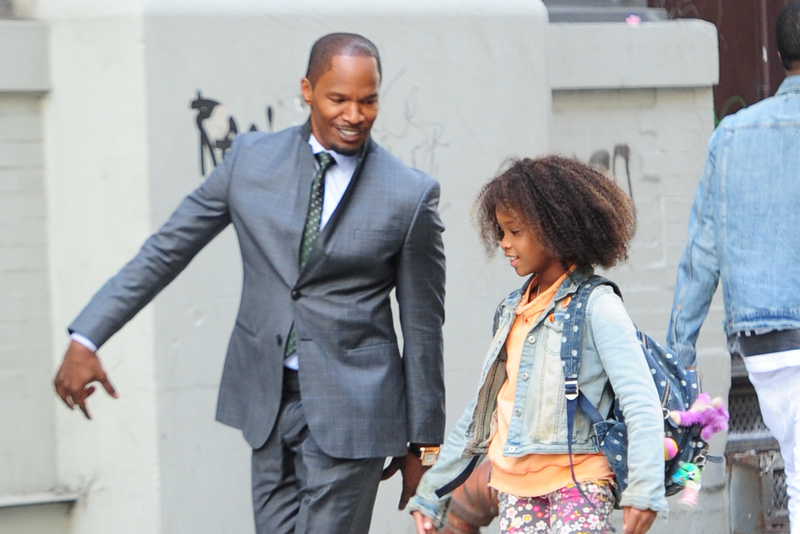 Quvenzhané Wallis as the titular Annie and Jamie Foxx as Will (Benjamin) Stacks, the proxy for Oliver (Daddy) Warbucks. However, once the light bulb went off in my head, shortly before the dead giveaway singing of “Tomorrow” I had the warm fuzzy feeling in my heart. Exactly as the dark trailer gods intended. I didn’t feel detracted at all by the fact that ‘Annie’ was a little black girl. It felt right. There are things I can complain about. The aggravating use of auto tune for one, but since it’s a movie rather than a stage production I can forgive this. Also I don’t recall being in awe of the raw singing ability of the lead role of Annie, but this is largely in part of the Dark Ages the original play invoked: Armies of little girls belting out “Tomorrow” at the top of their lungs. This is bound to happen again. To the haters out there though, those bold enough to try and say this happens all this time. You’re right, but the reverse happens maliciously. Ask any mainstream lady author why she needs to use her initials rather than her first name. Ask why there are so few minorities on the covers of novels. Ask why Caucasians are frequently cast into roles where the source material involves a Person of Color. In the case of Annie, the switch wasn’t made to shake a hornet’s nest or make it more marketable. It was simply done to bring a touching tale to the current generation and make it relevant, and I think it stands to do a good job with it.